A total of $740 million in public transit improvements will be made in Metro Vancouver over the next three years, and pre-construction work for the highly sought-after projects to extend SkyTrain’s Millennium Line under West Broadway in Vancouver and build 27 kilometres of street-level light rail transit (LRT) in Surrey will begin within the next 18 months. 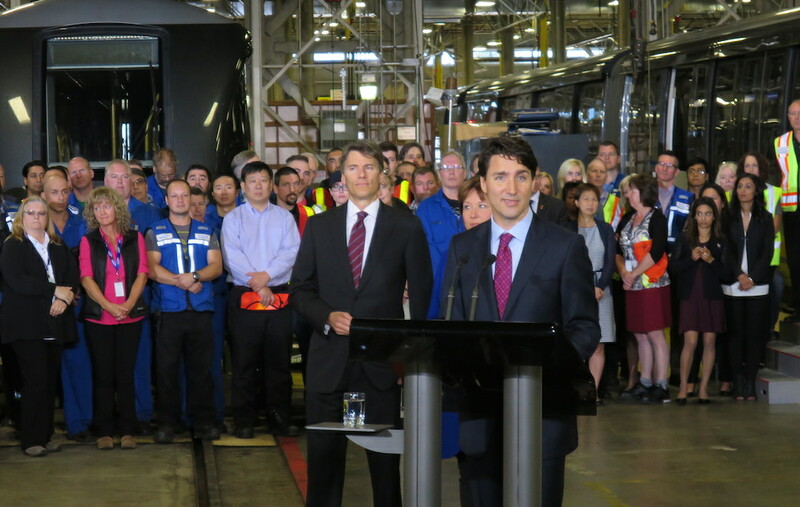 Prime Minister Justin Trudeau and Premier Christy Clark were at SkyTrain’s Operations and Maintenance Centre in Burnaby this morning to announce that both senior governments are providing $616 million in combined funding, with the federal government reaffirming its $370 million commitment announced during the first budget earlier this year. The provincial government is offering $246 million, which was announced in late-May, and another $125 million from TransLink will fill in the gap for the first phase of transit improvements. This follows the 50% federal, 33% provincial, and 17% TransLink and municipal level formula of funding transit in the region. Trudeau noted that the federal government will not dictate how projects are to be built and which projects are to receive funding, unlike his predecessor who required funding requests to undergo a federal-level business case analysis. However, projects like Surrey LRT could still be required to undergo a business case study by the provincial government in exchange for provincial funding, on top of a dual comparison business case by TransLink for both light rail and SkyTrain technologies. Approximately one-third of the funding for the first phase will go towards the procurement of new and additional rolling stock for the transit fleet. This includes: $112 million for 28 new Mark III cars (seven four-car trains) for the Expo, Millennium, and Evergreen lines to increase capacity by 12%; $88 million for 22 new cars (eleven two-car trains) for the Canada Line to increase capacity by 55% and reduce crowding; $21 million for five new West Coast Express cars; and a third SeaBus ferry vessel to increase service frequency from every 15 minutes to 10 minutes during peak hours. About $112 million will be used to perform upgrades on the Expo and Canada lines to ensure the stations can handle the increase in passenger circulation, within platform area and station concourse, from the train fleet expansion. For the region’s two major rapid transit extension projects, $43 million has been set aside for planning, design, and procurement activities of the underground SkyTrain extension on Broadway and Surrey LRT. Another $114 million is allocated for pre-construction for both projects, including road improvements preparing for LRT construction, improving SkyTrain’s power systems, and expanding the storage capacity at Edmonds Operations and Maintenance Centre. The budget also provides $196 million for the maintenance of existing infrastructure, including $92 million for upgrading bus maintenance facilities and SkyTrain’s communications, guideway intrusion, and security monitoring systems. The federal government says it intends to fulfill its campaign promise of providing $20 billion over the next 10 years for transit funding across Canada. It has already committed $3.4 billion for shovel-ready projects over the next three years, and the remaining for new major projects will come from future federal budgets. Over the coming decade, Metro Vancouver could receive as much as $3.75 billion from the federal government, covering half of the Mayors’ Council $7.5 billion plan. But this is dependent on the provincial government confirming its 33% share, approximately $2.48 billion, and TransLink and municipal governments finding new revenues to ensure they can fulfill their 17% share. In late-May, the Mayors’ Council proposed a hike on property taxes and transit fares, the implementation of regional road tolls, sale of surplus TransLink property, development fees, and the diversion of the region’s gas taxes to help raise the needed revenue. However, these new revenues for TransLink are also subject to provincial government approval, although not necessarily another transit plebiscite. “We don’t expect to have another referendum on this,” said Vancouver Mayor Gregor Robertson. “The federal funding is much more significant than what it was a few years ago, and it has meant that it means we have much less dollars to confirm in the region. We need to confirm those with the province though, which is an important step to ensure the entire 10-year plan committed.